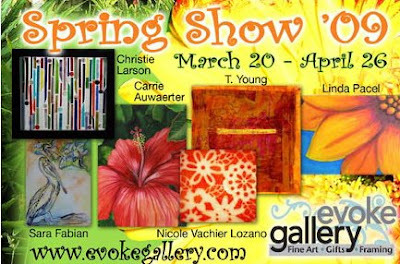 A few of my pieces recently arrived in St. Paul, Minnesota for the Evoke Gallery's Spring Show. 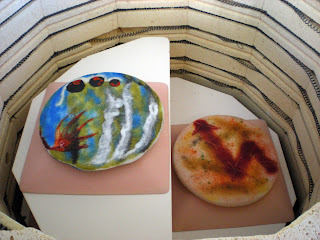 The pieces include functional items like the vibrant Sushi plates below, as well , display pieces like the ones I first posted as a response to an Inspire Me Thursday Challenge on Lace several weeks ago. 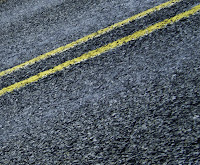 This exhibit will be on display during St. Paul's Spring Art Crawl and through April 26. Let me apologize for my absence in posting. The beginning of this year has been quite hectic. 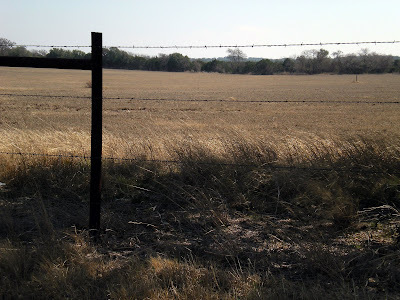 It seems every time I turn around I am back on the road from here to there throughout South and Central Texas. If you’ll indulge me, I’ll catch you up on my little adventures. I’ll start with one of my periodic drives up to Sweet Liberty Creations. 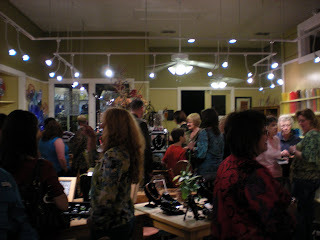 I make this trip now and again to visit Diana Kipfer’s studio in Liberty Hill, Texas. 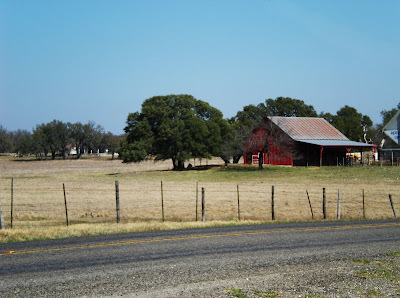 I love this drive up US HWY 281. My stress level seems to drop the moment I start heading north. The fresh Hill Country air and scenery just relax me. This time I took my camera and stopped to enjoy the day and take a few shots along the way. I actually dusted off my 35mm but still have not developed those prints. These I took on my nifty little coolpix. 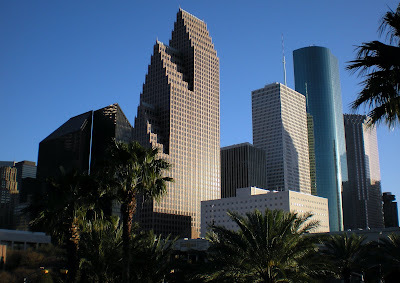 February 21st and 22nd I visited the very cosmopolitan city of Houston, as technical assistant for Gail Stouffer. 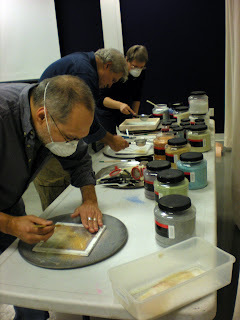 Gail was teaching Frit – Happens a workshop about using ground glass forms for interior design installations, at the Houston Center For Contemporary Craft (HCCC). It was great fun to travel with Gail, see old friends and make a few new ones. It also was a great opportunity to make myself intimately acquainted with the exhibit Hot Glass Cool Collections there at the Houston Center for Contemporary Craft during long stretches of the afternoon. 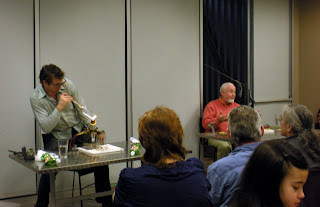 Then just a couple of weeks later it was right back to the HCCC along with Sam from Dream Fire Glass, for the closing events of Hot Glass Cool Collections. 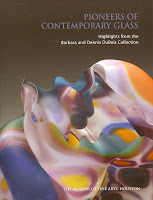 Gwynne did a great job of putting together an exhibit which encompassed the many broad areas of modern glass. In the busy hubbub brought by the final weekends events, I dragged Sam through the crowds to visit the discoveries I had made when first viewing these pieces in February. It was wonderful to meet and talk with some of the artists whose work was represented in the show. Including Paul Stankard whose book No Green Berries or Leaves I had read only a few months prior and Matthew Eskuche whose work was included in the HCCC's exhibit Enviroments=Form+Space. It is one thing to see work in a museum setting. It is another thing altogether to meet the artist, hear them speak and see them work. I'll tell you, it was easy for me to walk by Matthew Eskushe's installation the first few times and not think much about it. Hell, we walk past trash on the street all the time, right. But after hearing him speak and watching him work the installation takes on life. So real in fact was this instillation that at the end of that evening's cocktail party the catering staff was accidental picking up portions of the exhibit. Now that's realism. Not to mention a statement about how disposable a society we have become (my words not Matt's). 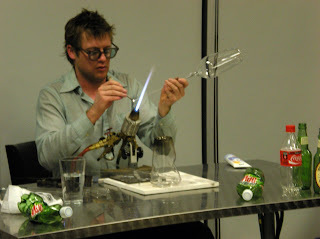 By the time Matt was done it was hard to tell which piece was trash and which was the one he had just created. The details and the feel for the object were all represented. It was fascinating to see and hear the variations, in philosophy and style, between these two artists. Paul Stankard's elegant paperweights, Matthew Eskuche's "trash" and all the other artists represented made this an intriguing event. In between the many events at the HCCC we were able to take a few hours to visit the Museum of Fine Arts Houston (MFAH) exhibit Pioneers of Contemporary Glass. A review of this exhibit, a quick spin around the museum in generally and it was back to the HCCC for one of their fabulous cocktail parties. 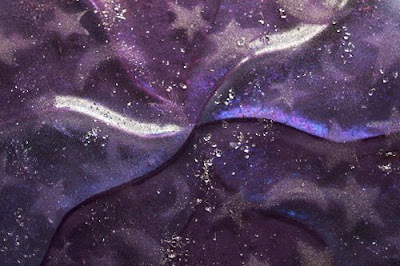 Although that brings us up to date on my travels I am presently backing my bags for a trip to Las Vegas where I will assist Gail once again as she instructs at Glass Craft Expo. 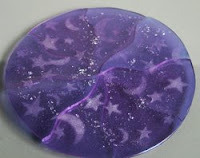 Then in June, Sam and I will be heading to the Pacific Northwest for BECON Bullseye's education conference and July brings a trip to the Pittsburg Glass Center to assist Gail with an exciting workshop. I better start taking a multivitamin. So many exciting things have happened so far this year. 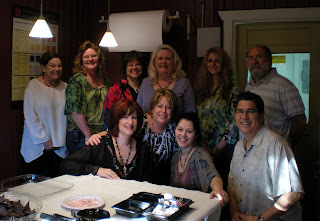 One of which was the opportunity to assist Gail Stouffer with a Intermediate Seminar course, at Wired Designs Studio. Ten fusers came together for eight weeks to learn new techniques and put them into practice developing a body of work. On the eighth week their work is shared with the public as part of a show held in tandem with the Intermediate Seminar lead by Nina "Sam" Hibler for torch workers. It's was such an honor to be a part of this experience, to see their work develop from week to week, to accept the challenge to complete many of the projects along with them and as an instructor have my work show with theirs. 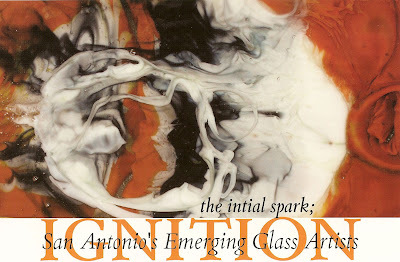 Ignition definitely was the right name for this show, which lit a fire under so many. Here are a few of my pictures from that night. You can't Judge a Book by it's cover... or Can You? One of the many benefits of being a member of the San Antonio Calligrapher's Guild (SACG) is having access to it's mobile library. Housed in eleven traveling boxes this collection includes books bought by or donated to the guild. Many are rare, out of print or where only ever printed privately. Where else would you find such a dedicated collection of calligraphy resources. With my love of books it was easy for me to volunteer to provide one of these boxes a home between guild meetings allowing me to peruse it's contents at my leisure. Most recently I have been working with the library committee to enter the contents of the library online at Librarything.com for all our members to view at their convince. This task is putting me face to face one book at a time with the library's entire contents. So what better an opportunity then this for me to share some of my finds from this unique resource. Here are a few gems from library boxes eight and ten. We've all heard the phrase, "you can't judge a book by it's cover". Well, sometimes you can. Here a fabulous example, Three Classics of Italian Calligraphy an unabridged reissue of the writing books of Arrighi, Tagliente and Palatino. The cover only alludes to what is held in the 248 pages inside its' covers, hand lettered examples originally printed in the 16th century. The beauty of the form makes understanding the Italian text unnecessary to the enjoyment of the work. With all of today's methods for quick and easy communication the written word executed pen to paper, stamped and mailed carries with it a significance no phone call or email can possible bring. There is something special about the commitment of writing something that will not be read for days, with a permanence not easily deleted or forgotten. 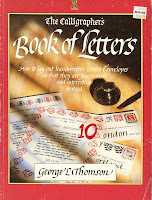 The Calligrapher's Book of Letters by George Thomson provides tips for writing such letters. The book itself is a compilation of letters responding to questions on how to compose letters of interest. Full a valuable tips this book as enjoyable as much of the information as for the letters themselves which serve as examples of the very instruction the writer intends to provide. 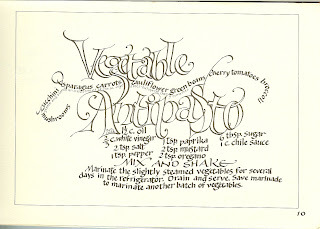 In box eight I came across several cooks books my favorite being the 1984 edition of Pots and Pens created by Valley Calligraphy Guild (VCG), in Eugene, Oregon. Handwritten and designed by the members of VCG this book is page after page of treats like the item below by Betty Locke which I hope she does not mind me sharing with you here. I enjoyed it so much I thought you might too. And we have only just begun our efforts with the online catalog of the SACG libary. There are still over seven boxes of books yet to enter. 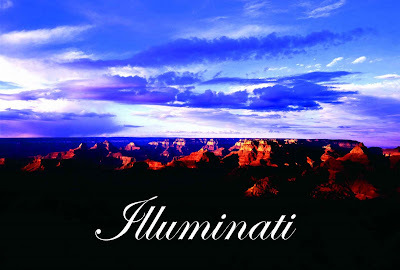 To view the potion of the collection entered to date visit http://www.librarything.com/catalog/sacg. I'll keep sharing my personal favorites as I discover them along the way. Hope you enjoy them as I have. The arts and craft fair includes handcrafted items made by regional artists including furniture, clothing, jewelry, stationery, candles, stained glass, wind chimes and more. Vendors will be set up inside the Family Life Center and outside on the campus. Look for my work to be set up inside the Family Life Center. Admission is free and the youth run a snack bar with breakfast and lunch. It's a nice way to spend part of your Saturday afternoon strolling among the handmade items. 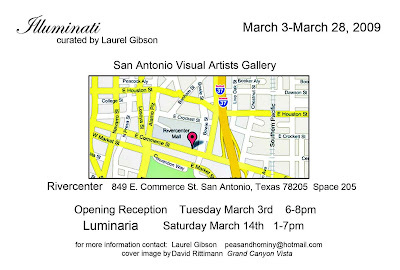 The two peices below were accepted into the SAVA Gallery show Illuminati, currated by Laurel Gibson to work in conjuction with the San Antonio Citywide festivities for Luminaria. 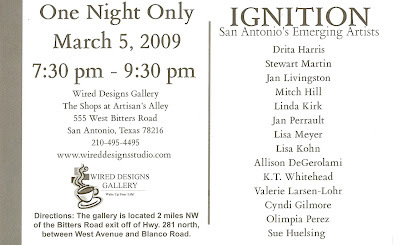 The show opening will be the evening of Tuesday, March 3rd and it will run throughout the month of March. 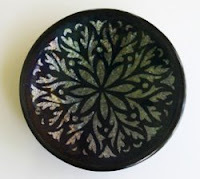 Above Left: Inspired by Chekhov's qoute above this is a 12 3/4" in diameter Kilncarved refleif. You can learn more about what promted me to make this peice from this previous entry.